There’s only one thing that beats making fresh, piping hot cinnamon rolls from scratch: making them with a Grace Baking French Baguette. Covered in a sublimely sweet drizzle of icing, this is a treat that only when baked in huge batches will any be left to be enjoyed past breakfast. Whipping up a panful of these is a piece of cake... so to speak. No dough, no yeast, no agonizingly long wait watching it rise only to wait even longer while it bakes, Nope. This is make & bake & share! Don’t forget to add a generous cupful of juicy raspberries for good measure – but any berry that strikes your fancy is just peachy. Take it from us; this one’s a delight that works wonders on a grumpy Monday-morning family. The best part? You get to take the leftovers to work and engage in a little taste bud team-building. Who knows, there could even be a promotion in it for you. You deserve it! Make the Spicy Mustard. Using a mortar and pestle, grind the mustard seeds into a powder. Transfer to a small bowl, and add apple cider vinegar, water and sea salt. Place one tablespoon of Spicy Mustard in a small bowl and set aside. Cover remaining Spicy Mustard, and refrigerate until ready to build sandwiches. Make Chive & Mustard Butter. To the small bowl with one tablespoon of Spicy Mustard add butter and chives. Mix until thoroughly combined. Cover bowl and refrigerate until ready to use. Preheat oven to 350˚F. Slice rolls in half and place roll bottoms in a small baking dish. 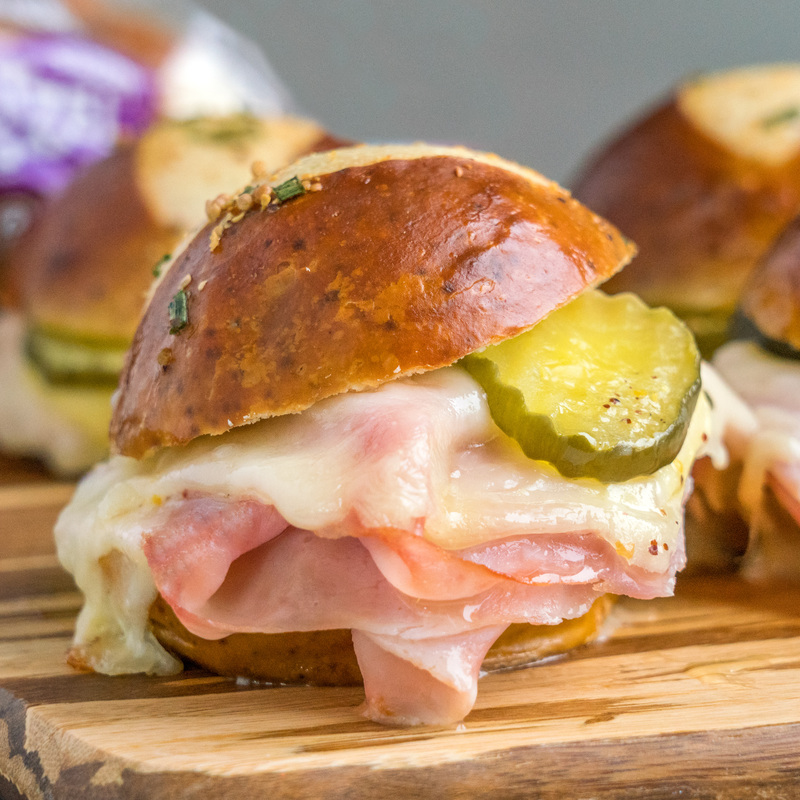 Spread the bottoms with the Spicy Mustard, and top with Swiss cheese, ham, White American, pickles and roll lids. Heat the Chive & Mustard Butter in the microwave until melted. Using a pastry brush, brush mixture over roll lids. Cover with foil and bake for 15 minutes. Remove foil and bake another 10-15 minutes or until cheese is fully melted.